• 10 x coached jumps (B-Rels) including 1 canopy pilot coached lesson and 1 additional tracking lesson. Where did you hear about AFF Camp? Click here to subscribe to our AFF Newsletter! 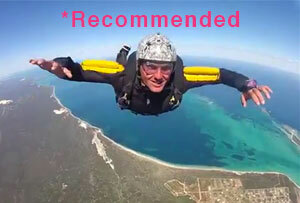 Why learn to skydive at Jurien Bay? Skydive Jurien Bay has commenced a world first “Accelerated Freefall/Wind Tunnel Course” which we have called our “WTF AFF Camp”, standing for Wind Tunnel Freefall Camp. It’s proven to be a massive improvement on the traditional AFF course and resulting in better skills, faster progression and fewer stage repeats. It’s the future and it’s only at Skydive Jurien Bay. Skydive Jurien Bay has a beach-side location, an immaculate safety record, the most highly qualified instructors, personalised tuition, accommodation included, amazing coastal views, modern equipment, and an awesome family vibe! 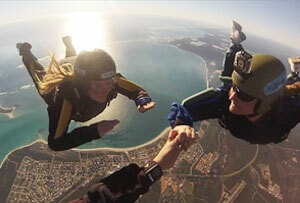 There really is no better place to learn to skydive in Perth, WA. In fact, a lot of our staff learnt to skydive with us and we’ve also had some students going on to represent Australia at world skydiving championships. Our new course is unique in the world. It has made learning to skydive easier, faster, safer and cheaper! It starts with an online training course which you can complete at your own pace at home. Then, you go to the iFly indoor skydiving tunnel in Perth for 20 minutes of Accelerated Freefall specific flying coaching (20 x indoor skydiving flights). This is the equivalent of 20 skydives, and will ensure you can remain stable and on-heading before you even get into the real freefall experience. This makes it unlikely you will need to repeat stages of your skydive course because you haven’t met the objectives of a stage. You then come to Jurien Bay for your ground school, which will be easy after you’ve already been introduced to the info in the online course! On this day, you should also do Stage One, which is a tandem jump. The focus on this jump is learning to fly your parachute safely and accurately. It will be different to a normal tandem if you have done one before, in that you will get a one-on-one lesson with your instructor on your landing pattern, flaring the parachute, finding the stall point of your parachute, and different types of turns. On your tandem you will also initiate the exit, do height awareness exercises, plus deploy and check your parachute. Learning to land accurately is an important aspect of skydiving and there are accuracy requirements to obtain your skydiving licence. This tandem lesson means you can get your licence signed faster and be a safer skydiver in the process. Next stage, normally the next day is Stage Two where you will jump your own parachute with one instructor looking after you in freefall, and also helping you via a radio in your helmet while you are flying your canopy. There are then an extra 5 stages when the fun really kicks off and you will learn 360 degree turns, forward movement, backflips and tracking. The best part is it will all be so easy because you have the confidence and control of the equivalent of 20 skydives in the indoor wind tunnel. Controlling your body in flight in the real environment of freefall is the best feeling there is. It will change your life! So! 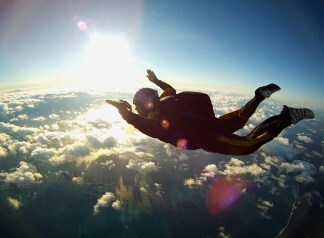 Learning to skydive solo will be one of the most amazing adventures of your life. It’s a fantastic physical and mental challenge that will leave you with a huge sense of accomplishment. It’s a popular activity amongst men and women, and the friends you meet during your skydiving journey will become like family. Due to high winds during summer the learn to skydive courses run only between March and October each year. Watch “Tasting Flight”, a documentary about the learning to skydive journey. Subscribe to our newsletter for more awesome content. Courses cease over Summer due to wind conditions unsuitable for student training and will commence again 5th March 2019. You will need to do your tunnel time in Perth before your course start date. It can be the day before or spread over the week before, whatever you prefer. Weekdays are best, but we operate our AFF Camp seven days a week between March and October. The first day of the course is mostly ground school with just one training tandem jump. The above dates have been set aside for this first day of training. If you cannot start on one of these days, please contact us. We may be able to be flexible depending on other bookings and the time of year. At some times of the year it is difficult for us to do your first day of ground school/theory training on a weekend, but you are welcome to contact us and we will do our best to work in with you! All costs are inclusive of your jump tickets, all training, gear hire, video of jump when with an instructor (this assists your learning significantly), accommodation, packing lessons, exams, your Australian Parachute Federation membership plus your very own skydivers log book. A deposit of $700 is required to confirm the start date of your AFF Camp, grant you access to the Online Learning Course, and book your tunnel flights. Additional fees will apply if a student needs to repeat a stage in their courses. 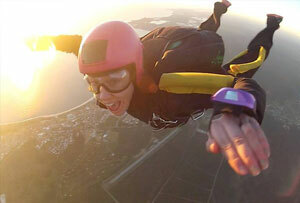 Contact us via the form on this page or call (08) 9652 1320 to speak to us about learning to skydive. You probably have a lot of questions so feel free to get in contact. Don’t forget to watch our AFF video as this will visually explain what you’ll do. There is a $700 deposit for your course, then you will be given access to our Online Learning Course. The online course is comprised of 10 lessons with a quiz at the end. You will be expected to have completed this course before you arrive at the drop zone, as it will drastically cut down the time we need to spend training on the ground, and get you skydiving much quicker. If you have paid your deposit and we have sent you your login details, then enter them in to begin learning (scroll up for login section). If you have not received your login details please check your spam folder in your e-mail or contact us. You must be reasonably fit to learn to skydive. Skydiving is a sport! You will need to be able to wear about 15kgs of equipment, run out landings, absorb the shock of deceleration as your parachute opens, and have strength in your arms to steer and land your parachute. If you have a reasonable degree of fitness you should be fine, but if you have breathing difficulties, obesity, or shoulder problems, particularly ones caused by recent or frequent dislocations, this may prevent you learning to skydive. If you have low levels of flexibility, we recommend to do some stretches in the time before you arrive. Bouncy, blow up ‘fitballs’ are perfect to lean back over on to stretch your back to improve your arch. Please phone us if you have any questions about your fitness to learn to jump. We have a skydivers shack next to our offices available for you to stay in. You will need to bring a sleeping bag or linen and blankets. There you will meet and socialise with other skydivers. This is provide free of charge during your course.